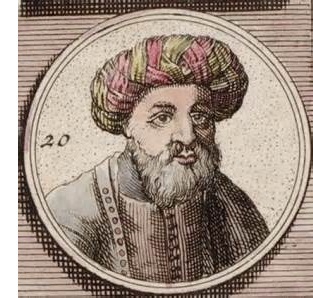 Shabbetai Zevi (1626-1676) - The story of Shabbetai Zevi is one of the most interesting historical events I have ever come across. I only heard about it for the first time from a history course I took in college and have not heard a single general reference to it since. It is the story of a Kabbalist Jew who was born in Smyrna in 1626, and, as an adult, came to believe that he was the Jewish Messiah. In the process, he began a movement (known as Sabbateanism) in which a significant population of Jews became his followers. Significant enough that the Ottoman Empire (in which Zevi lived) eventually took notice. As early as the age of 22, Zevi began to believe and proclaim that he was the "Anointed One". Interestingly, the name Shabbetai (or Sabbatai) literally refers to the planet Saturn, and in Jewish tradition Shabbetai Zevi means "The reign of Shabbetai", which is often associated with the Messiah. However, he was initially dismissed as a bit of a quack, and eventually cut off from the Jewish community in Smyrna. After such chastisement he gave up on the idea of being the messiah himself. That is until he moved to Jerusalem and met Nathan of Gaza. Nathan was regarded by many to be a prophet, and upon seeing Shabbetai Zevi, announced that the messiah had come. At first Zevi ignored Nathan's statements, but as more and more Jews began to accept them, he again became convinced that he was indeed the Chosen One. Now the Sabbatean movement had begun. In 1665, Nathan announced that Zevi would usher in the Messianic Era the following year by riding atop a golden lion with a "seven-headed dragon" in its mouth. By early 1666, when he was 39, the Sabbatean movement had spread throughout the Middle East and even into Europe. It was about this time that the movement caught the attention of Sultan Mehmed IV (the same Ottoman ruler who attacked Vienna in 1683). He ordered his grand vizier, Ahmed Köprülü (the man who preceded Kara Mustafa) to deal with the matter. As Zevi marched on Constantinople (Istanbul) in 1666 (apparently not riding on a lion) along with his followers in order to overthrow the Ottoman Empire, Köprülü dispatched soldiers to arrest Zevi. Shabbetai's kingdom was supposed to be established in peace and none of his entourage was armed. As a result, he was captured and imprisoned without incident. But this did not diminish the Sabbatean movement in the slightest. As long he lived, the possibility of his reign existed. After two months in Constantinople, he was moved to a prison in Abydos along the coast of the Hellespont. On September 15, 1666 he was moved to Adrainople where vizier Köprülü gave him the choice of converting to Islam or being executed. The following day, Shabbetai Zevi was brought before Mehmed where he cast off his robes, knelt before the sultan and had a turban placed upon his head. He chose conversion. The sultan was said to be well-pleased and rewarded Zevi by making him his personal doorman. His followers were humiliated and subjected to ridicule by Christians, Muslims and Jews who had not followed him. But some still clung to the hope that his conversion was part of the messianic plan and his kingdom would eventually come. It never did.